Right whales in the North Atlantic and North Pacific are not known to differ in their external morphology or coloration, so the diagnostic features of the North Atlantic species are repeated here. North Pacific right whales have a massive head that can be up to nearly one-third of their body length. The jawline is arched and the upper jaw is very narrow in dorsal view. The flippers are broad and tend to be more fan-shaped than the pointed flippers of most other cetaceans. There is no dorsal fin or dorsal ridge on the broad back. The flukes are very wide and smoothly tapered, with a smooth trailing edge and a deep notch. Most northern right whales are predominantly black, but there may be large white splotches of varying extent on the belly. The head is covered with callosities, areas of roughened skin to which whale lice and sometimes barnacles attach. The largest of these callosities, on the top of the rostrum, is called the bonnet. The widely separated blowholes produce a V-shaped blow up to 5 m high. Inside the mouth are 200-270 long thin baleen plates, which may reach nearly 3 m in length. They are brownish-gray to black in color. The fringes of these plates are very fine, reflecting the small prey taken by this species. Adults range in length to over 17 m, with females larger than males. Based on the North Atlantic species, newborns are 4.5-6 m long and adults may weigh 80-100 tons. The blow is V-shaped. In the northern extremes of their range, especially in the Bering and Okhotsk seas, North Pacific right whales may be confused with bowhead whales. Bowhead whales lack callosities and right whales have white patches only on the belly. Right whales are now extremely rare in the North Pacific and little is known of their current distribution there. Sightings and whaling catches have occurred in the Okhotsk and Bering seas, Gulf of Alaska, and around the Kuril and Aleutian islands. There have also been recent reports further south off Japan, the western United States, and Baja California, Mexico. These whales generally occur most often singles or pairs. Larger groups or aggregations may form on feeding or breeding grounds. They perform breaches and other aerial behaviors and generally raise their flukes before a long dive. As in the North Atlantic species, the mating system appears to involve sperm competition. Calving areas have not yet been identified in the North Pacific; feeding areas are most often in shallow coastal regions of the temperate to subpolar zones. Right whales feed on calanoid copepods and other small invertebrates (smaller copepods, krill, pteropods, and larval barnacles), generally by slowly skimming through patches of prey concentrated at or near the surface. Hunting by the Japanese began as early as the late 1500s, and by Europeans and Americans in 1835. North Pacific right whales have been protected for over 65 years, but illegal hunting continued into the 1960s. Russian whalers illegally killed 373 right whales in the eastern North Pacific in the 1960s, which may have been the bulk of the remaining population. Sightings are now rare, and major threats are largely the same as for E. glacialis. Although there are no reliable population estimates, it is thought that there are probably no more than about 1,400 North Pacific right whales alive today, and these are mostly found in the western Pacific. 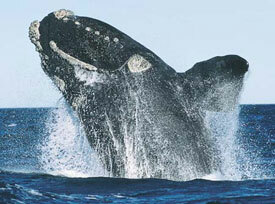 The current status of the North Pacific right whale is “Endangered” under the IUCN and ESA. Brownell, Jr., R.L., P.J. Clapham, T. Kasuya and T. Miyashita. 2001. Conservation status of North Pacific right whales. Journal of Cetacean Research and Management, Special Issue 2:269-286. Cummings, W.C. 1985. Right whales Eubalaena glacialis (Muller, 1776) and Eubalaena australis (Desmoulins, 1822). pp. 275-304 in S.H. Ridgway and R. Harrison (eds. ), Handbook of Marine Mammals, Vol. 3. The Sirenians and Baleen Whales. Academic Press. Kenney, R.D. 2002. North Atlantic, North Pacific, and Southern right whales. pp. 806-813 in W.F. Perrin, B. Würsig and J.G.M. Thewissen (eds. ), Encyclopedia of Marine Mammals. Academic Press. Rosenbaum, H.C., R.L. Brownell, M.W. Brown, C. Schaeff, V. Portway, B.N. White, S. Malik, L.A. Pastene, N.J. Patenaude, C.S. Baker, M. Goto, P. Best, P. Clapham, P. Hamilton, M. Moore, R. Payne, V. Rowntree, C.T. Tynan, J.L. Bannister and R. Desalle. 2000. World-wide genetic differentiation of Eubalaena: Questioning the number of right whale species. Molecular Ecology 9:1793-1802.